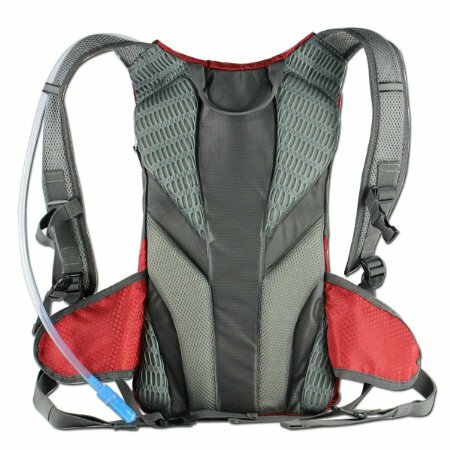 Hydration Backpack With 1.8L Bladder Bag (ECE-611Red),Hydration backpack pack with solar panel,hydration backpacks with bladder bag,cell phone battery charger cycling backpack,solar panel backpack biker bicycle backpack,solar panel charger waterproof bag,ECEEN Electronic limited. Attached: 1.8L Bladder bag and 10,000mAh Battery Pack etc. 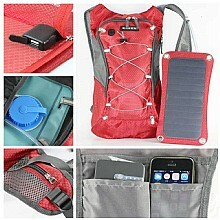 Solar Power Bag is a strong, durable, stylish, flexible backpack made by Nylon material. Includes 7 watts 22% efficiency solar panel, a 8 liter durable waterproof backpack, 1.8Litres Camel Bag and most popular Micro USB cables included. ECEEN Water Backpack, Solar Powered Bicycle Backpack is a stylish backpack with all of the functionality and looks of a well-equipped backpack with the addition of a solar charging module. The Solar camel bag have 1.8 litres water bag inside, you can drink water any time on bike. The front flap features a light-weight, flexible, integrated solar charging your cell phone, iPad or tablet if you don't have a power outlet. 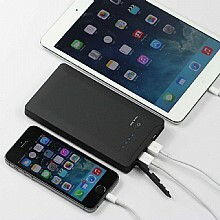 A powerful 10,000 mAh Li-Polymer, lightweight removable panel designed with cutting edge solar panel technology. 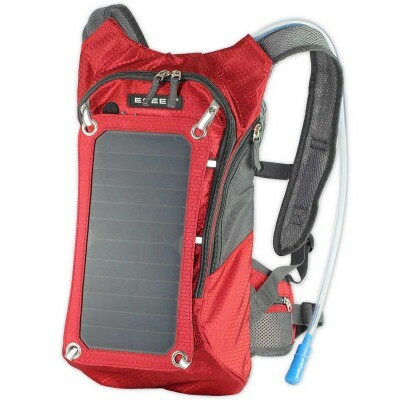 This product review is for the ECEEN 7W Solar Backpack with 1.8L Hydration Bladder. This is a nice, high quality sports backpack. The aqua color is very vibrant and contrasts well with the gray. There is plenty of room to store all of your gadgets. Included inside the bag was a solar panel rated at 6.5W with SunPower cells as well as a waterproof battery pack rated at 10,000mAh. Mine came half charged, with 2 out of 4 LED's lit up. I plugged it into an AC wall charger and it took about two and a half hours to fully charge the unit. Dual USB ports as well so you can charge 2 devices simultaneously. The solar panel attaches to the front of the bag via a small Velcro circle as well as four button straps, two on each side of the bag. Once attached it is very sturdy and did not move much during my testing. All of the zippers were very smooth and did not stick. The shoulder pads and the pads on the back side of the backpack are filled with thick foam. Even though I had the bag loaded up with my tablet, phone, snacks, and water, I did not feel any soreness on my back or shoulders. The hydration bladder holds about half a gallon (1.8 liters) and comes with a wide mouth grip so it's easy to refill. I had no problem with the attached hose during my outdoor test. 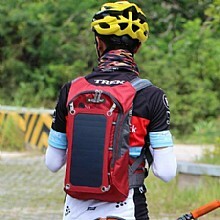 The Eceen Solar Bag is a great multipurpose backpack for a cyclist. The Eceen pack will hold 1/2 gallon of water, store several devices, and it comes with a 7 watt solar panel and a 10,000mAh external battery pack. While the Eceen Solar Pack will work for a hiker it may not have the ultra-tough shell, or the internal storage space, for long range hikes (especially in brush). - Has an internal water bladder that can hold 1.8 liters of water (1/2 gallon). The water bladder fills very easily, and the water comes out very easily. - The solar panel provides up to 7 watts of power - the solar panel does work even on cloudy days (although it will take longer to charge devices). - Another feature is that the Eceen Solar Backpack also comes with an 10,000mAh external battery pack. This is a very nice feature because it allows you to charge your devices directly from the battery (which will charge a typical smart phone 3 or 4 times) while you slowly charge the external battery from the solar panel. - The back is a bright teal blue - and is somewhat reflective on the back of a cyclist (or hiker). - The marterial on the Eceen is a thin nylon - ideal for a cyclist but it may not likely hold up for a serious hiker. - Space for all of the things you need for a day long trip - but it is not designed for anyone who needs an overnight backpack (which is true for almost all camelback style backpacks). - The pack is comfortable and is easily adjustable.